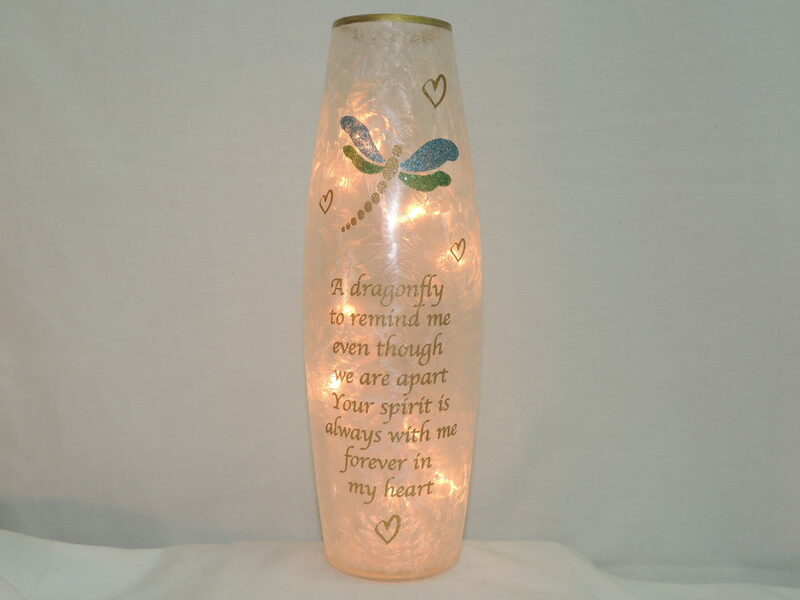 Dragonfly Accent Lamp Tall crackled glass 11.75″ high. 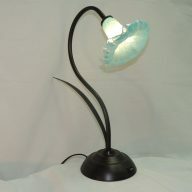 This Dragonfly Memory Lamp Vase is delightfully unique. The dragonfly has a body of gold glitter with blue and green glitter wings. 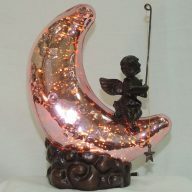 With a height of 11.75 inches with white crackled glass and gold painted rim, this memorial lamp will not be missed. For the final touch on this gift of light, the following is written in gold glitter: “A dragonfly to remind me even though we are apart, Your spirit is always with me forever in my heart.” There are also 4 hearts in gold glitter scattered about. You light this accent lamp by plugging it directly into the outlet. 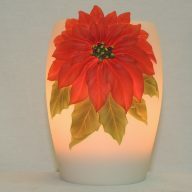 Lighting comes from a miniature light set coiled inside this gift of light and has 9 bulbs. There are 3 replacement bulbs included. For your utmost safety, there is a 3 Amp, 125 Volt fuse in the plug, with an extra included.